Condo w/ 2 Bedrooms - 2 Bathrooms - Sleeps 8 Trailside Access Lift served. The condo building is sited on a beginner slope (lift served with a Magic Carpet system approximately 35 yards from the building) at the Carinthia section of Mt. Snow in the Green Mountains of Southern Vermont. The Carinthia area is primarily a terrain park very popular with children and young adults. There is convenient access to the main mountain. Trailside advantage: No traffic to fight, no shuttles to contend with and no crowded parking lots. Ski down for lunch! Snow plowing and fire wood supplied by the condo association. Utilities included in all rentals. The fine Mt. Snow Valley restaurants are open all year. Lift is 40 yards from the building. Lift is 40 yards form the building! No land line. Excellent I-Phone service. Verizon is best. Superior hot air LP gas based system also electric baseboard units in bedrooms. Across from building entrance. About 40 feet. Coin operated. Soap supplied by owner. Parking included. Pass required to be placed inside of windshield. Two sets of dishes; two sets of silverware. many pots and pans. Dining room table separate from the galley kitchen. Seats eight. Roku device for Netflex members. Second DVD in bunk room. Perfect for children. Great trail side location. Ski on-Ski-off. 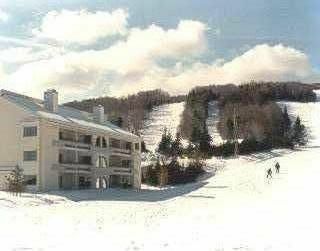 Our family of 5 had a great time skiing Mount Snow staying at this condo. It has super convenient ski access with the grommet magic carpet lift being right out back. Even better is the new Corinthia lodge being right next door. Getting your lift tickets, meals and shopping couldn't be more convenient. The condo was perfect for our needs with well enough room for more than our group of 5. The property was the perfect size for my family of 5. We had a wonderful Columbus Day weekend staying at Glen Run. The condo was clean and well kept. Everything you could need in the kitchen was provided. Plenty of space for my 4 kids to relax and unwind and not be on top of each other. Stephen was extremely kind and easy to work with. My kids and I are anxious to book our next trip to Glen Run during the ski season. Stephen the owner was very responsive. He provided me with detailed information that made checking in a breeze. The condo has everything you need if you choose to cook-in. The location allows you to ski out and avoid having to drive to the base if the grommet lift is running. I took my 2 sons up with a friend and we had a great time. I would certainly stay at this place again. Wonderful, convenient condo, right on the mountain. Very comfortable and clean and Mr. Cantor was very accommodating and supportive. Definitely a pick to consider! The owner Steve is so helpful. Answered the emails in a very timely fashion. He also went out of his way for us. The condo is clean and well equipped. Would definitely rent again. Great location facing new Grommet lift and Carinthia. Clean, all the amenities (TVs, WiFi, fire place, nice kitchen) and an owner who was happy to respond to all of my email questions throughout the stay. Highly recommend. Wi-Fi Available. six passenger lift. Ski:-All the chairs on the quad lift have been replaced with newer foot rest and safety bars.